It appears as if the Republican Party is on its way to massive losses in a few weeks, and based on the spectacle of what has now come to constitute a McPain-Palin Bloodlust rally, it justifiably couldn’t happen to a more despicable lot of characters. Drowning in a sea of flop sweat, McPain and Palin have now resorted to the ugliest kind of campaigning. Their rallies are over-the-top hatefests set to inflame and rabble-rouse. They certainly have the rabble all right, and they certainly are prone to rousing. Never mind that the only way McCain could ever pull this out was by attracting Independents. Now he simply takes refuge in fanning the hatred amongst the base, making the wildest of charges against Obama and throwing a series of rallies just short of lynching parties. These malevolent exercises in execration have all the civility of the Brownshirts running amok in Jewish neighborhoods in the 1930s. They have become the stuff of feature stories in national papers. McPain and Palin have urged the crowd on, and merely smiled and waved as their false charges against Obama have been met with blood-curdling screams of “Kill him!”, “Terrorist!” and “Treason!”. How long before they start setting Obama afire in effigy? Some might say it is just the usual rightwing lunatics being the loyal cultists they always have been. That’s the problem. These rallies have become so incendiary, it isn’t hard to imagine one unbalanced lunatic taking it upon himself to eliminate the problem. The problem being Obama. Just in the past six months we have seen two prime examples of the legacy of rightwing hatred, not to mention talk radio. First we had the cultist who worked himself into such a rage in Tennessee that, in his own words, since he couldn’t get to any “liberals” in positions of power, he decided to simply go to a Unitarian church where a children’s play was in progress, and put his shotgun to use on a few local progressives. After all, if they had been Republicans, if they had been real Americans, they would have been at a real church, not the Unitarian variety. By the time he was done exercising his First and Second Amendment rights, two innocents were dead and two more wounded. Police found his library consisted of books by Sean Hannity and Bill O’Reilly. This was followed by the fellow who became so angry at “liberals” that, the price of gas being what it is, he simply drove to the headquarters of the Democratic Party Headquarters in Arkansas and shot the party chairman dead. Never had met him, didn’t know him from Adam. He was a Democrat and that was reason enough to end his life. Look at some of the faces of rage at these McPain-Palin hatefests and ask yourself who next will be on a mission to deliver justice to “that one” . Back in the day I remember attending a debate where a Republican mocked the Democratic representative asking him if Michael Dukakis was really the best the Dems could do. The Democrat debater, paused, a pained look crossed his face, and then he stated, “probably not”. He went on to note that much of the best had been eliminated not by ballot but by Smith & Wesson. He went on to note that JFK, Medger Evers, Fred Hampton, Malcolm X, Martin Luther King, Bobby Kennedy, Allard Lowenstein, George Moscone, Harvey Milk and others all may have presented a better effort if they had been allowed to live to give it a try. When was the last time a NeoCon was murdered for his beliefs. Not just last time, any time? What does that tell you? And now even Cindy McCain has turned into an insulting hissing piss-bull. Hey Blondie, it’s bad enough that you never leave John-Boy’s side, as if you’re his service dog, or at least his assisted-living attendant, but the last thing the country needs is hearing from the beer baroness constituency. This is all tied into a larger picture I have discussed here lately. The Republican party’s attempt at dumbing down America. How perfect that they recruited Sarah Palin as part of the effort. The woman who can’t remember the name of one magazine or newspaper she reads. It is extraordinary that the GOP has spent the past eight years trying to make “elite” a pejorative. Only when the head of your party is dumber than a bag of rocks (Is our children learning?) do you have a vested interest in making stupid-good, smart-bad. The elite used to signify the best the country has to offer. The Elite Eight in the NCAA basketball tournament. The Navy Seals…elite. The Blue Angels…elite. Advanced learning classes…elite. Magna (inappropriate term) laude…elite. But the Orwellian newspeak folks that allow the environment to be ravaged under the (no laughing) “Clean Skies Initiative”, are simply up to their tricks as usual. When your party has been exposed as ideologically bankrupt, criminally incompetent and often immoral, the best you can do is try and put lipstick on the pig. Just like Chairman Mao’s indoctrination classes. Re-educate the populace to think that learning is an evil, that education is corrosive, that using the full capacity of your mind is intellectualism, a taint to be avoided at all costs. Thinking will just get you into trouble. 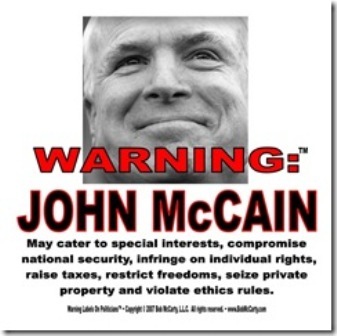 It is ironic, but so typical that John McCain, the man who falsely presents himself as Mr. Bipartisan, Mr. Work-Across-The-Aisles will have done such a criminally irresponsible job of dividing the country, inflaming petty hatreds and potentially inciting violence, when President Obama takes over. “Senator John McCain and Gov. Sarah Palin have been running one of the most appalling campaigns we can remember. They have gone far beyond the usual fare of quotes taken out of context and distortions of an opponent’s record — into the dark territory of race-baiting and xenophobia. 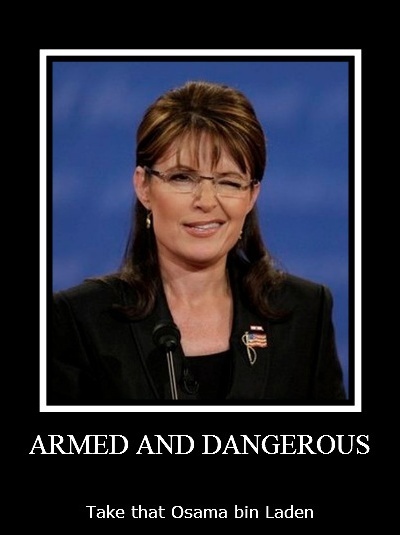 (Palin’s) demagoguery has elicited some frightening, intolerable responses. A recent Washington Post report said at a rally in Florida this week a man yelled “kill him!” as Ms. Palin delivered that line and others shouted epithets at an African-American member of a TV crew. It seems appropriate that McCain addressed a crowd the other day by calling them “my fellow prisoners”. Fact of the matter is, he is still in that bamboo cage. The fact that he has been re-fighting the Vietnam War ever since is proof. He left physically but never arrived home. We liked to think he hadn’t been broken by his captors. Now we know better. October 11, 2008. Tags: candidate, dishonest, economy, Evangelicals, Far Right, fringe, Hate, hate radio, McCain, mental illness, Obama, Palin, politicians, politics, predjudice, President, radical right, radical right. Democrats, religion, Republicans, Vice Presidency, Wall Street. candidate, Democrats, dishonest, economy, Evangelicals, McCain, mental illness, Obama, Palin, politicians, politics, President, religion, Republicans, Vice Presidency, Wall Street.